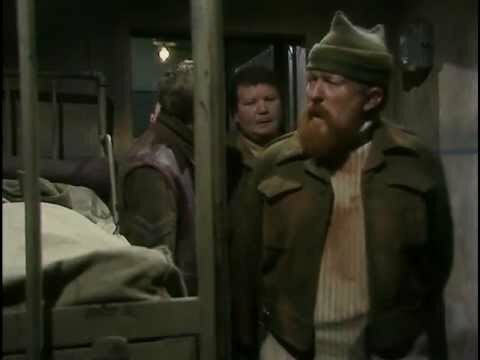 The Angriest: Colditz: "The Guests"
It is 28 January 1974, and time for another episode of Colditz. Three British commandos are captured and locked up in Colditz's attached general prison. Colonel Preston (Jack Hedley) agitates for their transfer into the prison camp properly, aware that an order from Hitler has decreed all captured commandos be executed. In an unexpected act of generosity it is Major Horst Mohn (Anthony Valentine) - a proud member of the Nazi Party - who comes to Preston's aid. When the British prisoners enact a plan to help the three commandos escape, the true motive behind Mohn's generosity comes to light. One thing that Colditz has done tremendously well is its way of representing the gradual passage of the war. It is represented in comments and exchanges of dialogue, but also in the slow and ominous way that the series has darkened in tone. Here we have Hitler's orders defying the Geneva Convention entirely - prisoners are now no longer confined to camps, but may readily be shot. It is not all doom and gloom. The episode draws a lot of entertainment value out of casting comic and actor Willie Rushton as Major Trumpington, the leader of the three captured commandos. He plays the role with a lot of insubordination towards his German captors, pomp and bluster, and ultimately a much more resigned and human man buried underneath. He and his fellow officers were based on real commandos briefly imprisoned at Colditz before being executed at Sachsenhausen. The TV counterparts experience a very similar fate. The episode's conclusion is both horrifying and bleak, but it is sadly also a very predictable one. The Great Escape, for example, had pretty much exactly the same conclusion. Occasionally realism and historical events can get in the way of a drama such as this: it is the appropriate ending, but it is also something one can see from a mile away. More impressive is Mohn's plot to tempt the British prisoners into revealing the successful path of escape taken by Grant and Carrington at the end of the first season. This angle gives the episode a nice sense of continuity, tying events back to the earlier episode and reminding the audience of how that escape was achieved. It helps to make this episode part of a broadly excellent whole series, which makes up for any shortfalls in making it a particularly impactful episode in its own right. It's solid, and well played, but not quite as good as the series at its best.